By using storage sleeves you can keep your film clean after they have been developed. The sleeves protect the film from dust and scratches when they’re being stored in a Negative Storage Box. By using storage sleeves you can keep your film clean after they have been developed. These sleeves protect the film from dust and scratches when they’re being stored in a Negative Storage Box. 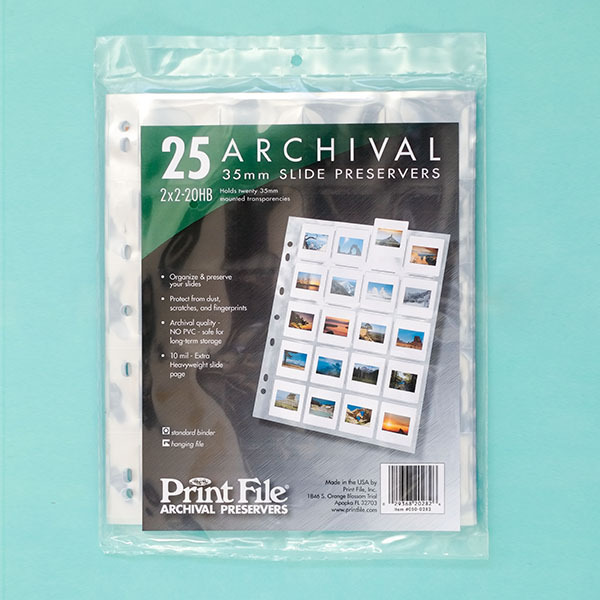 Printfile sleeves have an exclusive thin polyethylene back. Couple this with high clarity. You can make quality contact sheets without the need to remove or handle your negatives. The top sheet is 3mm thick and the bottom 1.8mm. These pages also have strong continuous seams which prevent negative hang up. Importantly, these sleeves are made from archival quality polyethylene with no PVC. Thus safe for long-term storage. They pass the Photographic Activity Test (PAT). Each pack contains 25 individual pages. Dimensions for each page are 9⅞ inches wide x 11⅝ inches high.